A Trip to Dublin - M&S AW12 Launch! After downing a glass or two of pink bubbly, the show began and it soon became apparent that my state of the art (ha!) camera could not cope with the lighting and movement. Seeing plenty of official photographers about, I decided to leave the hard work up to them. But I made sure to get one half decent picture of the gorgeous ex-Miss Ireland, Olivia Tracey. 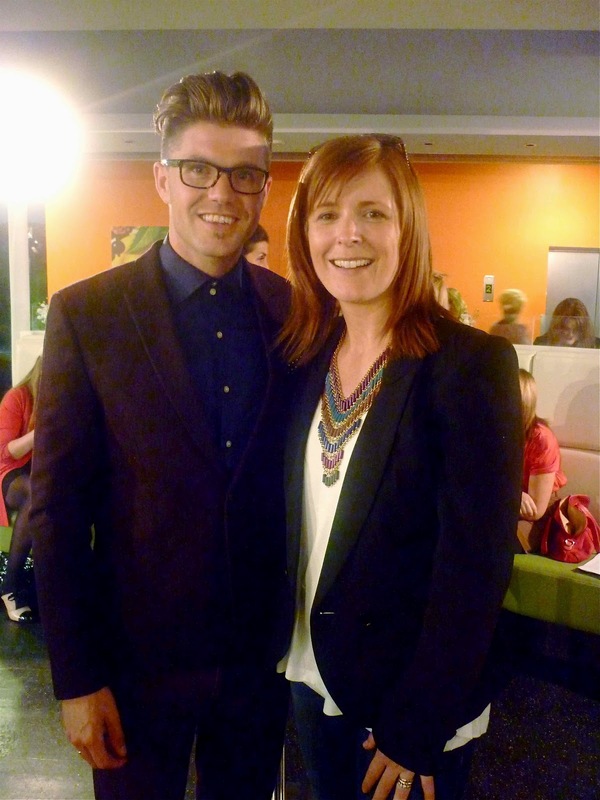 Oh, to look this stunning in my 50's..
After the show, I was lucky enough to get chatting to Darren Kennedy, TV Presenter, Fashion Journalist and one of Ireland's most stylish men, who was also well impressed with the latest M&S collection. Ever the gentleman, he was happy to pose for a photo. If Darren's website Help My Style is not already in your favourites, you've got to check it out. It's jammed full of fashion & beauty advice - right up my street! Again, bear with me on this one-it's truly lovely in real life! Finally, this dress is super versatile - you could wear it in so many ways. On a night out, at work or over skinny jeans. As well as featuring in the show, one of the girls in the M&S Marketing team was wearing it & it looked stunning on her too. I'll leave you with some of the PR shots from yesterday. Keep an eye on my Facebook page where I'll share the official catwalk photos when they come through. All items also available on the Marks & Spencer Ireland website. It looks like a lot of fun. See ... and you were wondering what to do when the girls started school - your job should be professional blogger - do you think the other half will agree to that? Loving this, looks like you guys had such fun, I recently tried on the green military coat as I was besotted with it in the ad, not so good if you have hips darnit! Love the contour dress though, great to see an on trend day piece with sleeves and a decent length! Amazing! nice collection ! loved what u are wearing too ! Your embellished top is gorgeous! Seeing as we've just come out of winter here in S.A. and are now well in the swing of Spring, I just can't find any winter stuff inspiring so I am focusing on your top which I love! Hard to believe that those clothes are from M&S. Looking forward to seeing them in 'real life'. Sounds like you had lots of fun. And as always, you look very chic! Win a Marks & Spencer Scarf! NOW CLOSED! Styled By You - School Gate Special! Meet Iva - Blog Swap with One Chic Mom! Styled By You - School Run Style Competition!